This week I went to visit a special friend who is in the fight of her life right now. Her pain is excruciating, affecting her mobility. Although she wants to keep active and independent, she knows accepting help from friends will be a key strategy in dealing with her health crisis. So she welcomes any and all food as it means less strenuous work time for her in the kitchen. She figured out pretty quickly that she would eat much better this way than if left to her own devices. This 'people person' confesses she loves the steady stream of company that have been around to support her. She lives alone and can't get out much as medication prevents her from driving right now. It has been a constant state of 'Open House' and she is lapping up the positive energy that is coming with it. I showed up for lunch with a quiche and a special hearty healthy salad ready to plate. The four hours flew by. She did pretty much all of the talking and I listened. Probably the way it should be. I didn't mind. Her tales are always so animated. She has a way of keeping the sadness at bay. Although her prognosis seems all too gloomy, we agreed it is just as easy to stay hopeful as it is to throw in the towel too soon. We don't have to predict the future and get it right, so why not take the path of brightness. She is convinced a happy outlook will give her extra time, as will great visits and good food. She may not be a doctor but I totally buy into her prescription. Quiche should be a staple in your repertoire of recipes for entertaining. It is timeless and the kind of dish that can be showy if you want to put some artistic flair into how you finish it off. A quiche is a very rich dish with its pie shell, cheese, and creamy filling. You can cut back on the calories by using a lower percent milk and less fatty cheese in lesser quantities. I counter the richness of this dish by dividing the pie into 8 pieces instead of 6 and rounding out the plate with a very healthy salad. I like a quiche for both practical and economical reasons. It is the kind of dish that can have all of its individual ingredients prepared ahead of time, making the final assembly minimal before it hits the oven. Some like to make the whole thing ahead and reheat it, but my preference is to have it fresh and slightly warm. It is also the kind of dish that can help you move along things lingering in your fridge or pantry. A chance to be creative and step away from the rigidity of a recipe. I follow some basic rules when preparing my quiche. I usually do a ratio of 1 egg to 3/8 cup of milk/cream. So for 4 eggs I use 1 1/2 cups of a milk/cream combo. 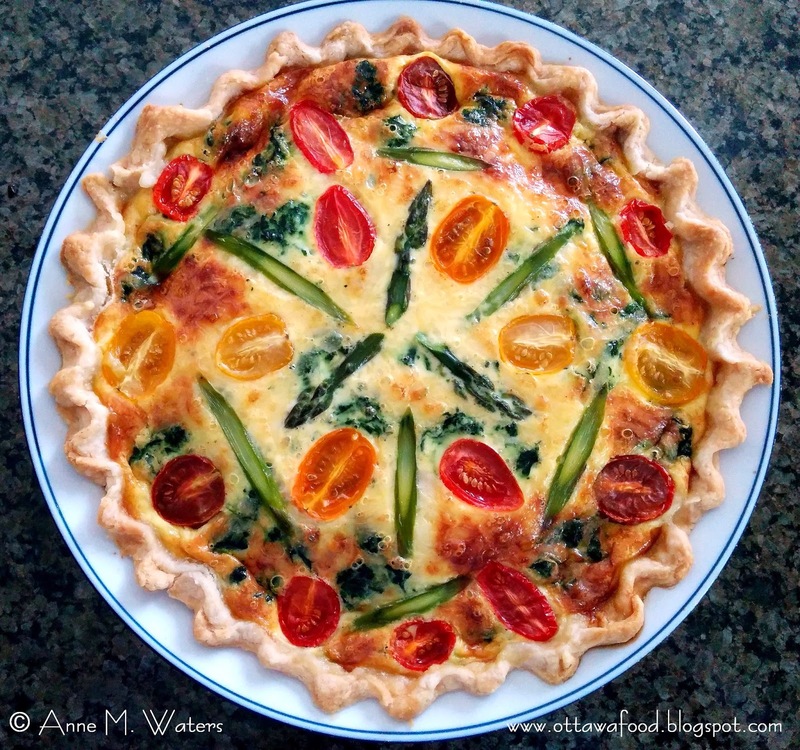 Ultimately how many eggs you use will depend on the size of the quiche pan or pie plate. If you are unsure, you can always start with a 3 egg mixture. I prefer 10% cream and use a 2 to one ratio of cream to milk. You can go as low cal and as high cal as you like. I am sure there is some chef somewhere boldly using all whipping cream for the liquid. I dare not be so rich. I use about 6 ounces of grated cheese and I take my lead from the other flavours in the dish. My go to cheese is Jarlsberg. But I also like Gruyère and chèvre goat cheese. Sometimes I mix them. Even cheddar could do if it was Old. I find a harder cheese works best. I avoid the more creamy cheeses like Havarti. I like a bit of meat like ham or bacon or even lardon. My preference is a crumbled bacon. I use enough to cover the bottom of the quiche as my first layer. If I use ham I cut into cubes. I use a good sized cooking onion,diced. I like to sweat it off and bring a little colour to it. The cooked onions must be completely cooled before going into the quiche. I do not use garlic but this time I added two ramps, known as wild leeks. The bulb ends were sliced and sautéed with the onions. Then the rough chopped ramp leaves were added just to lightly wilt them. If I add spinach, I steam it first and then wring it completely dry. It too needs to be cooled. It helps to rough chop it so it distributes evenly. 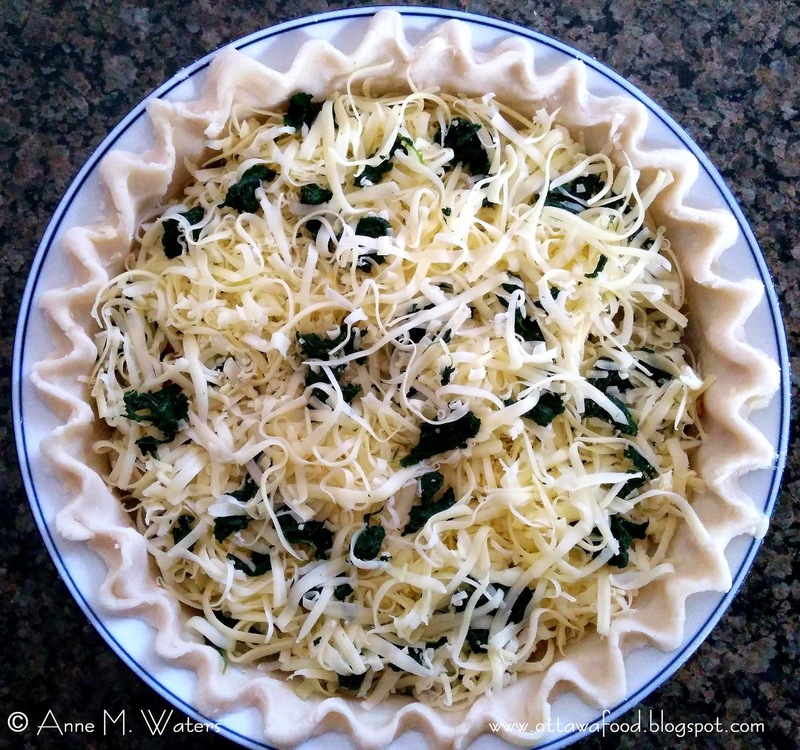 I like to toss it with the grated cheese before adding it to the quiche so I can avoid large dark green blobs presenting through the surface of the quiche. You could also use mushrooms and red pepper but the key is to make sure they are cooked off well before using. Any extra moisture coming from these additional flavour ingredients means that your quiche is at risk of not setting properly. It will still taste great but it could end up being a mess on the plate. It could also ruin the crust from baking properly. Speaking of the crust, I make sure to chill it well after it has been put into the quiche dish and before loading in the filling. This will help to have a nicely browned bottom to your quiche. I find this saves me from blind baking it. 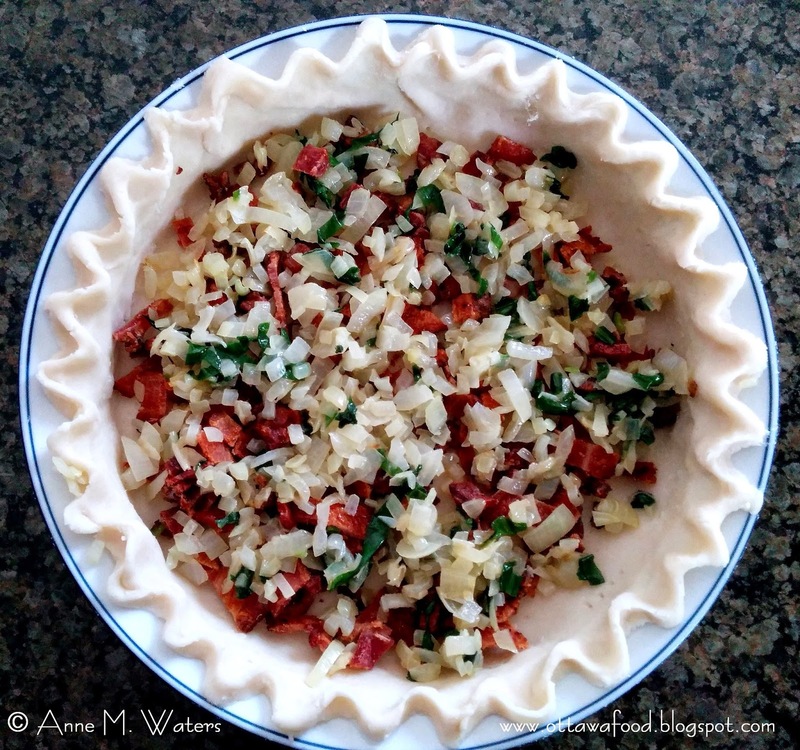 Sprinkle the crumbled bacon over the bottom of the chilled, pricked, unbaked pie shell. Cover with the cooled sautéed onions and ramps. Cover with the mixture of spinach and grated cheese. Beat the eggs and add the milk, cream, salt, pepper, dry mustard and cayenne. Mix. Then pour slowly over the ingredients in the pie shell. 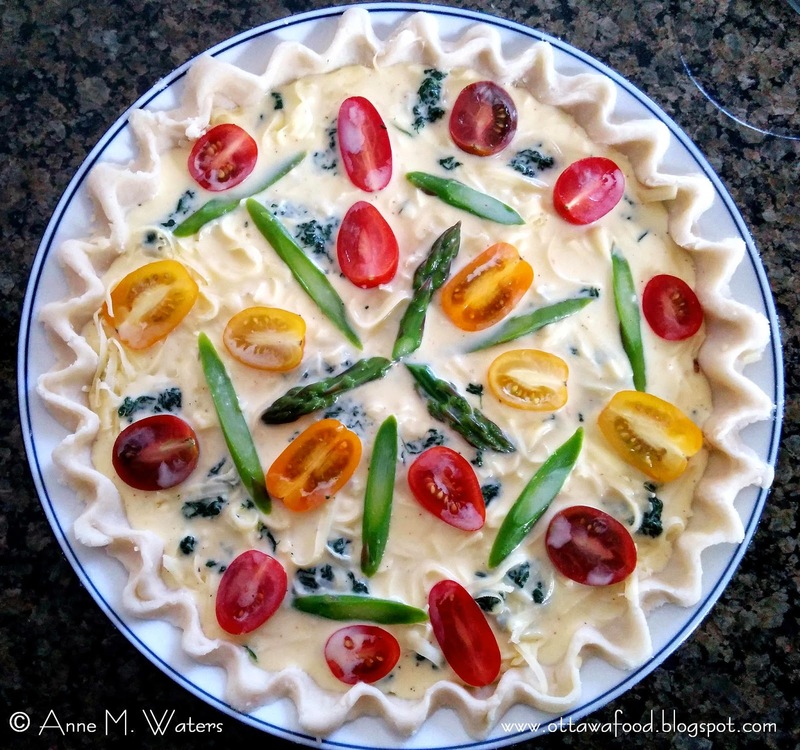 Decorate the top of the quiche with the slices of asparagus and the grape tomato halves. Bake at 375ºF for 45 to 50 minutes until lightly browned and firm. That looks beautiful. Give my best thoughts to your friend.